I recommend a Sequim home inspection to all my buyers. When you buy a home, you’ll want a thorough inspection of the home, the heating and electrical, the plumbing, the structure, the roofing, the crawl space, the appliances that stay, and so on. If there is anything wrong or any problems, you want to know during the due diligence period. Newer homes in Sequim are less likely to have serious issues, but older homes could have. An experienced, detail oriented, and patient inspector is easily worth the $400 you’ll spend on a Sequim home inspection report. 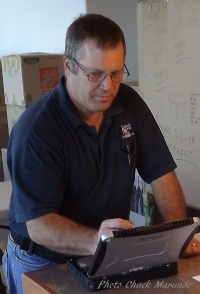 In this photo, Alan Jogerst, owner of Hadlock Home Inspection is conducting a Diamond Point home inspection. Diamond Point is only 12 miles from Sequim and a short distance from Port Hadlock. Alan uses a laptop computer with special software to add information and photos while he is on site, and then he emails a full copy of the detailed report the same day to the owner and to the buyer’s agent. If you do find a serious issue that you want to address with the seller, you must use a form 35R, which is an Inspection Response form. In that form you can ask the seller to repair the problem, or you might ask for a credit at closing. If you don’t respond at all within the inspection time period, you automatically waive any right to terminate the transaction based on the Home Inspection Addendum. When you have mutual acceptance, your buyer’s agent will help you coordinate all the details of your Sequim home inspection and complete the due diligence necessary. One Response for "Sequim Home Inspection and Due Diligence"
You’re right that a home is the biggest investment a person makes, so a thorough home inspection is essential. Who you chose to be hour home inspector is critical. You want a detailed written report that tells you everything that is wrong or might need repair. But what you don’t want is a home inspector who feels like he has to find things that are are not really wrong or that don’t need repair. Many home inspectors are paranoid, like loan underwriters, and they will end up killing transactions by including a paranoid approach in how they write up the inspection report, and they will scare the hell out of buyers unnecessarily. A good inspection report tells the truth but does not speculate into extremely unlikely or silly extreme arguments about things the inspector honestly knows are not concerns. Too many professionals are so intent on covering their backside for liability purposes, they include boilerplate paranoid phrases in every report, and end up scarring buyers away. That’s not helping the buyers or sellers. Professionalism, attention to detail, integrity, and skilled in writing a good report are all vital for a home inspector today.